The international student population at RIT has more than doubled over the last 10 years driven by explosive enrollment in graduate programs. A record 2,497 international students from 103 countries are studying at RIT this academic year. Pictured from left are students Yuwei Qiao of China, Paola Gonzalez of the Dominican Republic and Jassim Dalwai, who was born in India and raised in Kuwait. RIT has long recognized the importance of diversity to organizational growth and synergy. Beginning in the 19th century, when we welcomed women into our classes decades before other colleges even considered co-education, we have intentionally sought students, faculty, and staff from multiple backgrounds, ethnicities, and countries. The 1968 addition of NTID (National Technical Institute for the Deaf) brought an intellectual, linguistic, and programmatic diversity to RIT that is unmatched in higher education. We are likewise proud of the high percentage of low-income students enrolled at RIT (as measured by the number of Pell grants awarded annually) as well as of our growing ranks of under-represented and international students. The unmatched diversity of our academic programs is a direct result of the diverse voices that constantly participate in the RIT conversation. Through our new strategic plan, we will intentionally develop practices, opportunities, and programs that harness the power of difference to drive creative solutions, innovative combinations, and productive collaboration. RIT will be among the top five national universities in global engagement, as measured by the breadth and size of its international student and alumni populations. 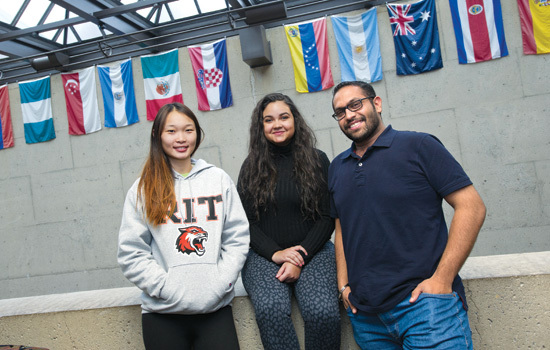 RIT students and faculty will be internationally recognized for their global experience, their mastery of intercultural competencies, and their engagement with globally relevant problems. RIT will establish targeted centers of collaborative research with international universities, laboratories, and/or corporations in areas of common expertise and aligned goals. RIT will be the largest producer of female, under-represented male, and deaf or hard-of-hearing STEM graduates among all private colleges in the U.S.
RIT will eliminate the achievement gap between under-represented and majority students, becoming a model of inclusive excellence for all students. RIT will become a model of inclusive excellence for all faculty and staff in the areas of professional development and promotion. RIT will reflect diversity and inclusion as core values in assessing performance and promotion at all levels and in all functions of the university. RIT will be a model of excellence in its deployment of difference to solve problems and practice innovation. RIT will initiate a comprehensive marketing campaign to make all current and potential stakeholders and higher education at large fully aware of the university’s extraordinary history, its unique character, and its exceptional record of success. Establish research partnerships in emerging international centers of excellence. All undergraduate programs will identify a place in their curricula for a specific program opportunity through which students can participate in a global, international, or multicultural educational experience. Develop 10-year plans for increasing the number and percentage of females, under-represented males, and deaf or hard-of-hearing students in STEM majors. Using an asset-based assessment and research model, develop a profile of success factors and institutional challenges for under-represented males.